Bring your family out to the Redberry Lake Biosphere Reserve from 11 to 1 on December 1 and 8. Put on your snowshoes (also available at Redberry) and take a winter hike followed by hot chocolate and smokies. RSVP to communications@redberrylake.ca, 549-9311. We Are Many is holding their annual general meeting at 7 pm on December 6 in the Victoria School library. Membership in the Saskatoon Nature Society is a really good deal. For $20/person or $30/family, you get a newsletter, a chance to participate in a wide variety of field trips as well as monthly meetings with speakers. Plus, Nature Society members receive a discount at Don's Photo Shop, 1902 8th St. E., on photo-finishing and certain other items in the store as well as a 10% discount at Early's Farm and Garden Centre on all regularly priced wild bird feeding products, bird houses, books, etc. Memberships run from January to December, so now is the perfect time to take out or renew a membership. The owner of Eden Flowers Ltd. in University Heights says her flower shop is 98% green. All of the flowers are fair trade and most of them are sourced out of British Columbia. All the waste is recycled. 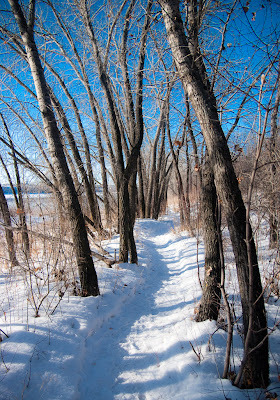 If you notice a section of Saskatoon’s trail network that needs to be cleared or to report a problem, call the City of Saskatoon’s trail maintenance hotline at 975-2476. Vancouver will be the first city to include recycled plastics in the asphalt used to pave and repair roads. The plastic, which is 1% of the asphalt mix, is more expensive but uses less fuel, so it will save money in the long run. Why We Need Cities in Tune with Nature lists the benefits and best practices concerning urban green spaces. A recent study found that a 20% increase in nearby green space was equivalent to another 5 years of life. A new hospital in Singapore may be the greenest in the world with window boxes and 140 fruit trees in the lobby and on the roof. The hospital is monitoring the number of birds and butterfly species as an indicator of success. Oxford, a new community in northwest Edmonton, will require all homebuilders to meet energy conservation standards. All homes must achieve a minimum EnerGuide rating of 78 or be certified to Built Green Silver standards or equivalents. Grants will be available for homeowners who want to move beyond those standards. Funding is also available for secondary suites. Fracking is gaining momentum in the United States as a source of local and state tax revenue. Pennsylvania is considering drilling at 6 universities that are eager for new revenue sources. Money outweighs environmental concerns – will they regret it in the future?